Drapery glass was invented by the glassmakers at Tiffany Studios to recreate, in glass, the folds of fabric in garments. It was also used extensively in floral windows when representing saucer magnolia trees. 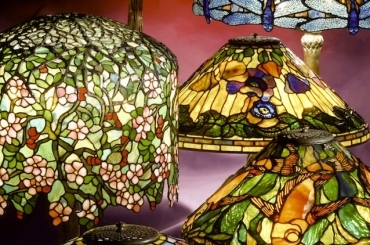 Tiffany’s lamp department used this unique glass in the large 28″ Magnolia shade. 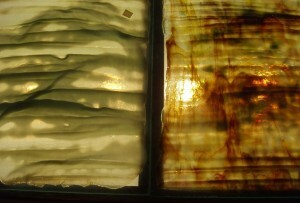 In the photograph to the right, you will see a full piece of drapery glass in reflected light – the same sheet of glass is on the left in the photo below, shown lit up on our light table. When making flat sheets of art glass, the molten glass (2200 degrees F) is scooped from the furnace with an iron ladle and put onto a steel table . It is then rolled with a steel roller (usually attached to the table) to form the flat piece of glass. To create drapery glass, the molten glass is shaped by taking a hand held roller and using it like a rolling pin to create “speed bumps” on the surface. It can also be tugged and pulled by hand using steel tongs to create the deep fabric-like folds in the surface. It is easy for the glassmakers to get burnt while making this unusual glass and extreme care must be taken while rolling the glass. 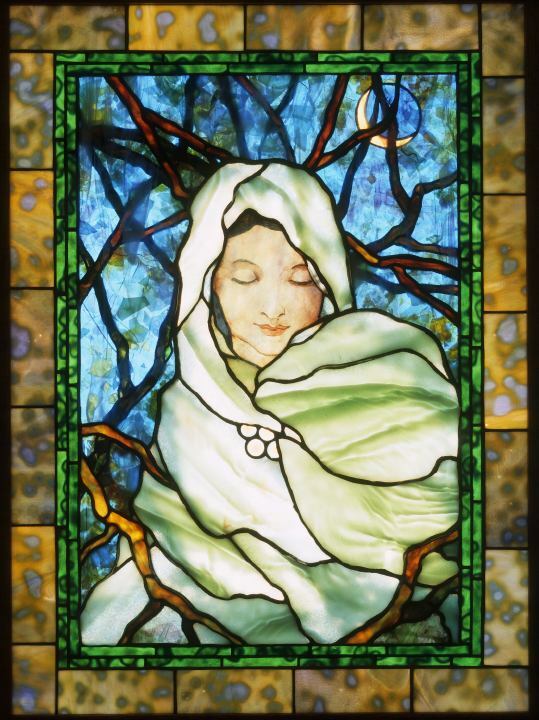 Because of the amount of hand work involved, sheets of this glass can only be created at a very small size – often 1/4 to 1/3 the size of a regular sheet of art glass. Over the years, Century Studios has collected a variety of one-of-a-kind sheets of drapery glass for use in our lamps and windows. 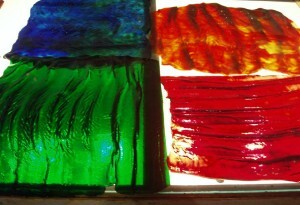 Glass manufacturers occasionally create drapery in unusual colors as can be seen in the sheets laid out on our light table. These unusual and intense colors are used for garments in windows such as the Red Angel window shown on our website. The lush green drapery can be used for grape leaves in windows or large lamps.